In the past 20 years, we have seen personal phone communication transform from a clunky box-shaped device to flip-phone cellular devices and now to an incredible, interactive smartphone device that Marty McFly himself would not have seen coming. It is truly incredible what communication platforms now allow a user to do. Businesses, however, operate at a much higher volume than your average smartphone user. While a lot of companies issue smartphones to their employees for on-the-go work, their day-to-day business communication systems must be more complex and capable of handling a much higher volume of tasks. Luckily, the call software industry has introduced the Voice over Internet Protocol (VoIP) era. Companies that utilize the power of the internet to host voice communication have been able to tap into a powerful source. 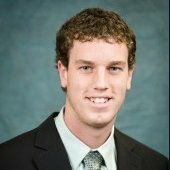 Two of the companies excelling are RingCentral and 8×8, inc. 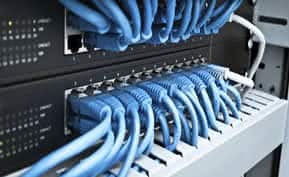 Both of these companies offer similar services that can be tailored to independent needs, but both require some setup — whether it be installing internet-capable hardware or using internet adapters with already existing phone lines. Both of these companies offer a similar service but differ in look, feel and user experience. Here we will see how these companies stack up in some of the most critical and universal feature fields of VoIP service providers. 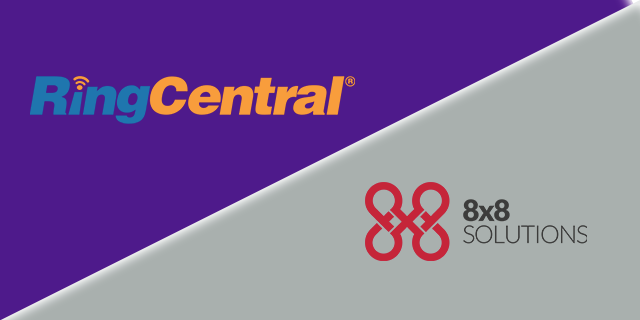 Lets take a side-by-side look at RingCentral vs 8×8. 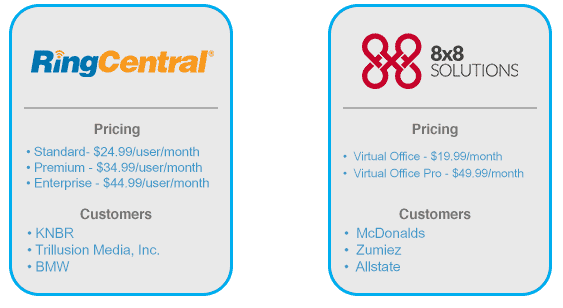 RingCentral is a cloud-hosted PBX (private branch exchange) system that provides a lot of the basics you would hope for in your company’s communication system. For example, it allows you to create your phone number on a local, toll-free or international basis. It comes with an auto receptionist and a music-on-hold feature. 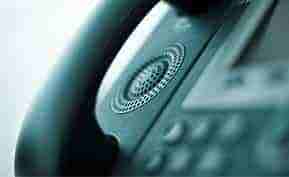 Some of the more complex features available are caller ID and caller reports. Much like RingCentral, 8×8, Inc. comes with all the standard features such as auto attendant, phone number porting and music on hold. Also a cloud-hosted PBX, the service does allow for extension dialing, caller ID control and client transfers. TIE – It shouldn’t come as much of a surprise that these two companies are so similar in the basic features section. The RingCentral mobile platform essentially allows you to access your entire PC or Mac system on any Android or iOS device. RingCentral also has a feature known as business SMS, which provides unlimited business-based text messaging and is compatible across all platforms. You can even send or receive texts on your desktop computer or mobile device. 8×8 also allows for complete access to the system on your mobile device. The company’s mobile accessibility will even help you save money, because making long-distance calls is within the 8×8 call plan; the platform also helps you save minutes by offering a 4G, cellular or wifi connection to work under. Perhaps the most convenient feature for companies with traveling representatives is that the 8×8 call plan includes no international roaming fees. 8×8 – Both companies offer a mobile platform to access their VoIP system, but 8×8 tailors its features more to the international and globally present company. RingCentral does not make you implement completely new hardware; the vendor prides itself on being able to use their analog adapters to convert any phone for internet use. The platform also has an intuitive desktop app with advanced features that allow your computer to handle voice, fax, text, conferences or online meetings. RingCentral also comes standard with a call flip feature that lets you switch a call from internet to mobile. 8×8 lets you control how your name shows up on another person’s caller ID, and even lets you block or unblock yourself as a caller. The platform enables your employees to transfer or hold calls, pick a phone number from any area code or block access with the do not disturb feature. RingCentral – RingCentral has a more intuitive interface and cleaner user experience when it comes to the desktop app and mobile compatibility. RingCentral not only offers conference phones, but allows you to connect with your clients via HD video meetings as well as web/audio conferencing. RingCentral has a call park feature, which allows you to “park” a call in the cloud for a coworker to pick up. Even better, the platform’s presence feature lets you see the availability of other company employees before calling them. Like RingCentral, 8×8 provides the call park feature and presence features, and is even capable of performing online/web-based meetings. 8×8, however, also features a web/video/audio conference call bridge and an instant message feature. While most companies offer the instant message function, 8×8 allows you to consolidate all of your contacts — across Facebook, Gmail, Twitter or any other social or messaging platform — and have them available to chat right on your computer screen. 8×8 – Though both vendors offer collaboration features for clients and coworkers, 8×8 is more advanced with the in-depth features it provides to employees. Simply put, 8×8 allows anybody to communicate effectively across multiple platforms and to a variety of people. Thinking it’s about time to upgrade your VoIP communication system? Check out a side-by-side comparison of these companies and the other industry leaders in our FREE Top 10 VoIP Business Phone Systems Report.